Basic investigation on receiving complaints. Land acquisition and disown related to school lands. Approving the estimates such as school development society facilities fees and service fees of National Schools in Western Province. Other various activities and projects. Giving recommendations to the Ministry of Education regarding the all private schools teachers in Western Province for their institutional purposes. Giving recommendations to the Ministry of Education to do the institutional procedures of piriven teachers in all 134 piriven in Western Province. Activities related to "Prgnajanani scholarships". Activities of donated scholarships given by presidential funds. Giving recommendations to overseas leave of school students (National Schools) approving overseas leave for provincial Schools. Institutional activities of special schools. 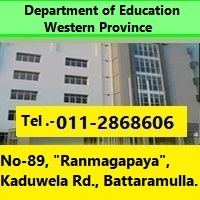 Giving approvals to the educational trips and field trips of National Schools in Western Province. Giving approvals to provide Western Province National Schools main hall (auditoriums) and playgrounds for external institutions.